Sometimes when I hit my neighborhood farmers market New Morning Farm on Saturday mornings, I have a plan. Other times, I just start tossing whatever looks good into my basket. This dish, which I served with broiled salmon, definitely came about on one of those latter days. The other weekend, the market had beautiful scallions with bulbs so large they almost looked liked spring onions. 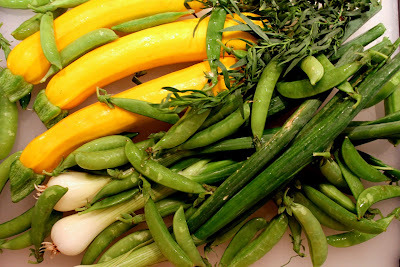 Lots of nice color here too with the golden summer squash and bright green sugar snap peas. 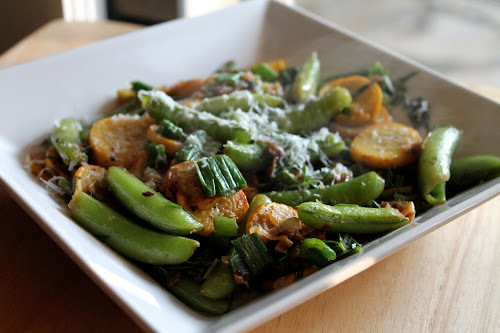 For additional summer flavor, I added lemon juice and tarragon, plus some grated pecorino romano. For some reason, there's something about that cheese that works so well this time year. I end up using it more than parmigiano-reggiano, my usual favorite. 1. Heat olive oil in a large saute pan over medium to medium-high heat. Add scallion white parts and sauté until soft and lightly browned, about 5 minutes. Add squash and sugar snap peas and saute, stirring occasionally until the squash is soft and lightly browned, about 5 minutes. Season with salt and pepper as it cooks. 2. Turn off the heat. Add the scallion greens and lemon zest and stir to combine and wilt the scallions. Remove pan from stove. Add the lemon juice and fresh tarragon and stir to combine. Serve in bowls topped with grated pecorino romano. Another amazing creation. I'm always impressed with how you whip up stuff like this.